The panelTabbed control can be used to display a group of contents that belongs to a showDetailItem. 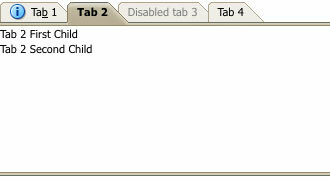 Tab bar(s) with tabs representing the showDetailItem children are displayed. Selecting a tab, displays the associated showDetailItem. If none of the showDetailItem children are selected, the first showDetailItem that is enabled is selected. Typically you would put one or more showDetailItem components inside of the panelTabbed but you may also alternatively place a facetRef, group, iterator, or switcher inside of the panelTabbed as long as these wrappers provide showDetailItem components as a result of their execution. This component can be stretched by a parent layout component that stretches its children, e.g. panelStretchLayout if the dimensionsFrom attribute is set to "parent". You can specify dimensionsFrom="disclosedChild" for the panelTabbed to be as tall as the currently-disclosed af:showDetailItem. When using this "disclosedChild" setting, the stretchChildren attribute on af:showDetailItem and any height assignment on the panelTabbed must be omitted or else there would be a competing assignment for how tall the component will be. You can also specify dimensionsFrom="parent" to make the panelTabbed get its dimensions from the inlineStyle and if not provided from there then from its parent component or if not provided from the parent then from the skin (stretchChildren on af:showDetailItem will be honored). Using dimensionsFrom="auto" will choose either "disclosedChild" or "parent" depending on whether the panelTabbed is being stretched by its parent. PanelTabbed is an overflow component. It must be part of a supported layout in order to work properly on the page. in a container that has a set width. Under these circumstances, when the overflow component is larger than the parent container, the overflow component will display an overflow button. Selecting the overflow button will show a popup containing the items that didn't fit on the page. in a container that does not stretch its children. in a container that displays multiple children horizontally without explicit sizes for each child. For example, a panelGroupLayout with layout='horizontal' would be invalid, but panelSplitter is OK because it has an explicitly set splitter position. setting the overflow component with a styleClass or inlineStyle that assigns a percentage width value. Note that this includes assigning styleClass='AFStretchWidth' on an overflow component. The following is an example of panelTabbed. The following example renders with the tab bar appearing only above the contents. oracle.adf.view.rich.event.ItemEvent Apply Request Values The itemEvent is triggered when a containing object has an event on one of its child items. For example, a panelTabbed will launch an itemEvent of type 'remove' for one of its child tabs. Apply Request Values Event delivered to describe an attribute change. Attribute change events are not delivered for any programmatic change to a property. They are only delivered when a renderer changes a property without the application's specific request. An example of an attribute change event might include the width of a column that supported client-side resizing. attributeChangeListener javax.el.MethodExpression Only EL a method reference to an attribute change listener. Attribute change events are not delivered for any programmatic change to a property. They are only delivered when a renderer changes a property without the application's specific request. An example of an attribute change events might include the width of a column that supported client-side resizing. binding oracle.adf.view.rich.component.rich.layout.RichPanelTabbed Only EL an EL reference that will store the component instance on a bean. This can be used to give programmatic access to a component from a backing bean, or to move creation of the component to a backing bean. "lazy": ShowDetailItem children will be populated when they are likely to be disclosed and kept in memory thereafter. customizationId String Yes This attribute is deprecated. The 'id' attribute should be used when applying persistent customizations. This attribute will be removed in the next release. If the oracle.adf.view.rich.geometry.DEFAULT_DIMENSIONS context-param is set to "auto" in the project's web.xml, the default value for this attribute will be "auto". Otherwise, the default value will be "parent". First character must be an ASCII letter (A-Za-z) or an underscore ('_'). Subsequent characters must be an ASCII letter or digit (A-Za-z0-9), an underscore ('_'), or a dash ('-'). inlineStyle String Yes the CSS styles to use for this component. This is intended for basic style changes. The inlineStyle is a set of CSS styles that are applied to the root DOM element of the component. Be aware that because of browser CSS precedence rules, CSS rendered on a DOM element takes precedence over external stylesheets like the skin file. Therefore skins will not be able to override what you set on this attribute. If the inlineStyle's CSS properties do not affect the DOM element you want affected, then you will have to create a skin and use the skinning keys which are meant to target particular DOM elements, like ::label or ::icon-style. partialTriggers String Yes the IDs of the components that should trigger a partial update. This component will listen on the trigger components. If one of the trigger components receives an event that will cause it to update in some way, this component will request to be updated too. Identifiers are relative to the source component (this component), and must account for NamingContainers. If your component is already inside of a naming container, you can use a single colon to start the search from the root of the page, or multiple colons to move up through the NamingContainers - "::" will pop out of the component's naming container (or itself if the component is a naming container) and begin the search from there, ":::" will pop out of two naming containers (including itself if the component is a naming container) and begin the search from there, etc. the position of the tab bar. Defaults to "above". In accessibility screen reader mode, tab bar position is always "above". rendered boolean Yes whether the component is rendered. When set to false, no output will be delivered for this component (the component will not in any way be rendered, and cannot be made visible on the client). If you want to change a component's rendered attribute from false to true using PPR, set the partialTrigger attribute of its parent component so the parent refreshes and in turn will render this component. shortDesc String Yes the short description of the component. This text is commonly used by user agents to display tooltip help text, in which case the behavior for the tooltip is controlled by the user agent, e.g. Firefox 2 truncates long tooltips. For form components, the shortDesc is displayed in a note window. For components that support the helpTopicId attribute it is recommended that helpTopicId is used as it is more flexible and is more accessibility-compliant. styleClass String Yes a CSS style class to use for this component. The style class can be defined in your jspx page or in a skinning CSS file, for example, or you can use one of our public style classes, like 'AFInstructionText'. determines if tab removal is enabled. none - tab removal is not enabled. all - tab removal is enabled on all tabs, regardless if they are disclosed. The last tab in the panelTabbed can be removed. allExceptLast - tab removal is enabled on all tabs, regardless if they are disclosed. The last tab in the panelTabbed cannot be removed. Choosing to remove a tab will cause an ItemEvent of type 'remove' to be launched. This event can be listened for on a showDetailItem using the itemListener attribute. It is up to the developer to handle this event and code the actual removal of the tab. This is because of the dynamic nature of the panelTabbed component, which may have dynamic children. This also allows a finer level of control by the developer, who can then choose a custom implementation that may (for example) include warning dialogs, and control of which tab gains focus after a tab is removed. visible boolean Yes the visibility of the component. If it is "false", the component will be hidden on the client. Unlike "rendered", this does not affect the lifecycle on the server - the component may have its bindings executed, etc. - and the visibility of the component can be toggled on and off on the client, or toggled with PPR. When "rendered" is false, the component will not in any way be rendered, and cannot be made visible on the client. In most cases, use the "rendered" property instead of the "visible" property. Copyright © 2012, Oracle. All rights reserved.